Provide your smallest guests with a place to sit with the Lancaster Table & Seating stacking restaurant wood high chair with walnut finish! 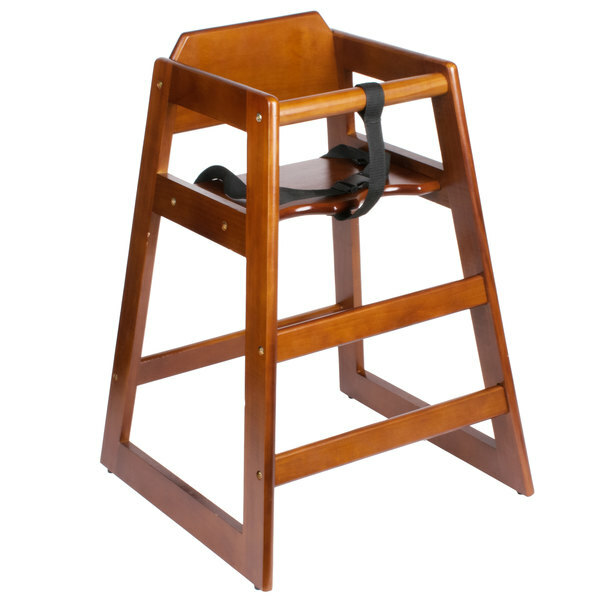 Thanks to this sturdy high chair, you can easily keep your youngest guests safe and tightly secure while they're in your family-style restaurant or diner. The chair is designed to keep children comfortably restrained, which helps to prevent any injuries or accidents. Plus, the classic walnut color adds a nice visual contrast to your tables and booths. Thanks to the rounded corners, this high chair ensures that children have a comfortable place to rest their arms while they sit. This also helps prevent other guests and wait staff from injuring themselves should they brush against the chair during their stay. A nylon safety harness and seat belt secures a child in place so they can't wiggle free and fall. When not in use, the chair features a stackable design to help save space. To save on costly shipping expenses, this chair ships unassembled. Make sure you can accommodate guests of all ages with this high chair from Lancaster Table & Seating.